Parish secretaries with Fr Paul Roberts and Bishop Vincent Long OFM Conv during Parish Secretaries' Day at the Shrine of the Holy Innocents, Kellyville. Image: Mary Brazell/Diocese of Parramatta. 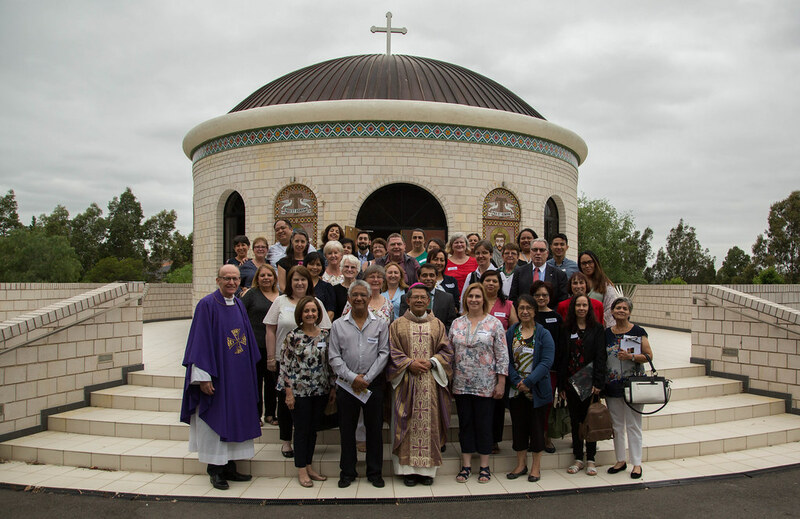 Parish secretaries from parishes in the Diocese of Parramatta gathered for a day of reflection and celebration at the Shrine of the Holy Innocents, Kellyville. Before the rush of Christmas, the group of 50 parish secretaries came together on Wednesday December 5 to reflect on the year and their role as the “ambassadors of God’s love and mercy”, according to Most Rev Vincent Long OFM Conv, Bishop of Parramatta. Geoff Officer, Chief of Operations & Finance, Diocese of Parramatta, welcomed the parish secretaries and thanked them for their service. The parish secretaries were taken through a reflection session led by Fr Paul Roberts and Donnie Velasco from the Institute for Mission (IFM), Blacktown. The topic – ‘Themes of Christian Leadership’ – was adapted with a focus on the kinds of leadership that is reflected in parishes. Donnie Velasco said “when we talk about Christian leadership, our focus isn’t on a formula or results or an outcome, but an openness to seek and learn, an openness to wrestle with God’s plan for our lives, and an openness to the hearing the promptings in which God is calling us to do and to be. VIEW: Images from the Parish Secretaries’ Day and Christmas celebration below or here. In the second session, the secretaries were asked to reflect on five topics in relation to their ministry in their parish. The responses were then recorded by the IFM team to be given as a gift to the secretaries and to affirm their role as the “first face of the Parish”, according to Sr Grace Roclawska CSFN from the IFM. Mass was then celebrated in the Chapel with Bishop Vincent and Fr Paul. During his homily, Bishop Vincent reflected on the spirit of Christian service in which the parish secretaries carry with them. “On this day, as we gather and reflect on the work we’ve done and the people that we have served, we are reminded of our mission of sharing the Good News and being part of God’s loving plan for the world. “I’m sure there have been times that you have felt like the disciples when confronted with difficult situations or even worse, difficult people, in the office, you may be in a position to disengage and to seek a more comfortable space. “Yet the call of the Gospel is to launch ourselves forward and to be at the service of people’s needs, no matter how challenging they may be. So it is our yes to the command of Jesus to give all of ourselves that makes the good news possible. Following Mass, lunch was celebrated with the parish secretaries and members of the Australian Conventual Franciscan Friar community, and a special cake was brought in to celebrate Bishop Vincent’s birthday on Monday. Malia hopes that by being a young parish secretary, it will open opportunities to get more youth involved in the life of the Church. “Taking on this role, one of my main goals is to bring young people into the life of the Church, so not waiting until we are of old age.